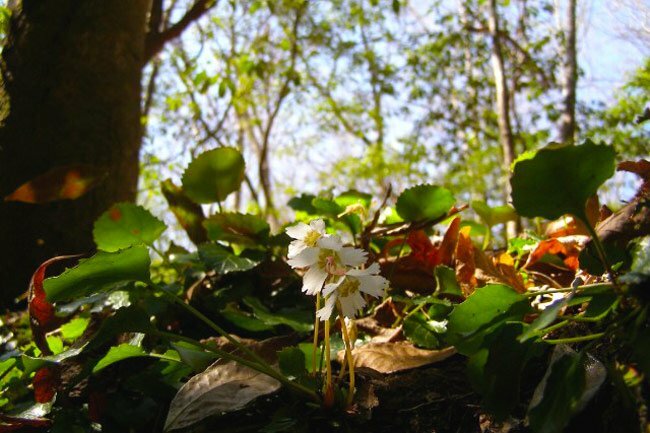 This rare wildflower’s common name, Oconee Bell, honors its bell-like shape and the area in which it was first discovered by French botanist Andre Michaux in 1788. Found in Oconee County near present-day Devil’s Fork State Park, the species was collected by Michaux and stored in an herbarium in France, not to be rediscovered in the wild for nearly a century. When American botanist Asa Gray found Michaux’s specimen in 1839, he embarked on a search for the plant in the place where Michaux described having discovered it, “the high mountains of Carolina.” This description led Gray to look for the plant in a higher elevation than it grows – searching North Carolina peaks such as Grandfather and Black mountains – rendering his exploration fruitless. Fast forward nearly 40 years, to 1877, when 17-year-old George Hyams found it growing along the Catawba River near his home in North Carolina. Hyams collected a specimen of the plant, which he had never seen before, and showed it to his father. His father had also never seen the plant and gave the specimen to a botanist friend, Joseph Congdon. Congdon then sent Hyams’ find to Gray, who, upon receiving it, exclaimed that the rediscovery of the plant had given him “a hundred times the satisfaction that the election to the Institut did.” The Institut refers to Gray’s admittance to the Academie des Sciences of the Institut de France, one of the highest achievements for any scientist. Inspired by the find, Gray again set out to locate the plant in 1879. This time the excursion was led by young George Hyams, who took a party composed of Gray, his wife, her brother and sister-in-law, and fellow botanists William Canby, Charles Sargent, and J.H. Redfield to see a colony of the wildflower that grew near his home. In 1886, Charles Sargent, who served as the director of Harvard University’s Arnold Arboretum for over 50 years, arranged his own venture to the Carolinas to hunt populations of Magnolia cordata, eventually finding a colony of Oconee Bells (Shortia galacigolia) where Michaux first discovered them. The plant’s scientific name, Shortia galacigolia, was given by Gray upon his 1839 discovery of Michaux’s specimen, which was unnamed. Gray honored his friend and fellow botanist Charles Wilkins Short with the name. Oconee Bells grow in the wild primarily along stream banks in the South Carolina Piedmont, North Carolina, and Georgia. The plant is federally protected and endangered in North Carolina and Georgia. The best place to view the plant is along the Oconee Bell Nature Trail in Devil’s Fork State Park. It flowers from mid-march to early April. 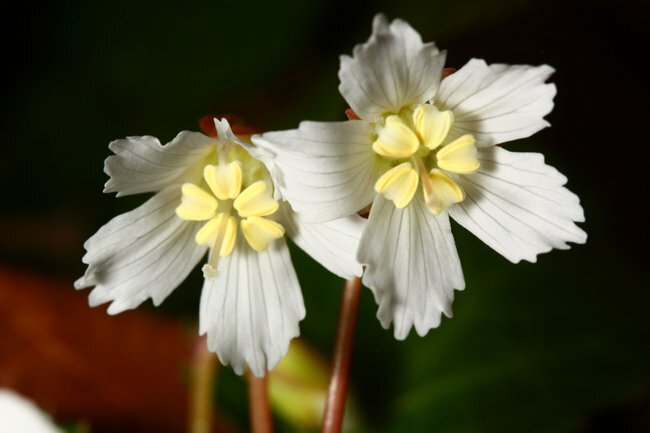 Deborah Davis describes taking her above photos: “The Bells are very hard to photograph as they are a member of the Galax family and grow low to the ground, the blooms are white, small and the heads are bowed. I am sure I must have looked quite amusing lying on the ground, legs stretched across the creek and bent over at the waist trying to get a good shot. It was exhausting but worth it. I am so proud to live in Oconee County and very thrilled to have the chance to see the Bells in the wild.